It was Palm Sunday last of April 1st. Remembering my childhood days, my mother never missed this day being a devout Catholic. They would summon me, my brothers and my sister to go with her to attend mass in celebration of Palm Sunday. Philippines being dominated by Catholic religion Palm Sunday is very important occasion. This is to commemorate Jesus Christ triumphal entry to Jerusalem met by people bearing palm leaves. 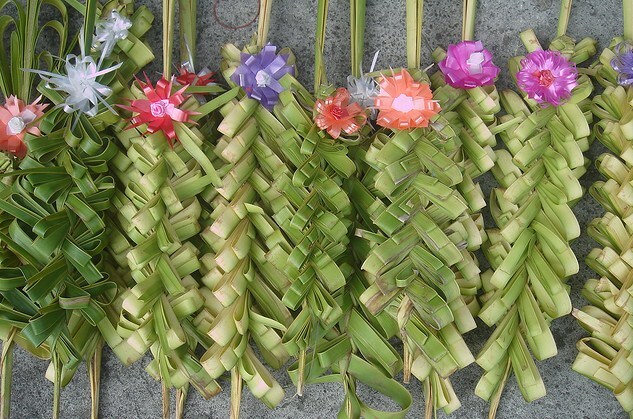 Palm Sunday is the start of the Holy Week. I remember lining up bearing young coconut leaves shaped in the best way my young imaginative mind could design. As practice in Philippines Catholic churches, we substitute palm leaves with young coconut leaves. There was a designated place inside the church for those bearing the leaves. The priest would come to us and whisked Holy Water on the leaves. After the mass, we brought home those leaves. My mother put them in the altar. Those blessed leaves are believed to drive evil spirits. Growing up, my parents allowed us to choose the religion we will be comfortable with. I am no longer a Roman Catholic and so with my two brothers. My sister chose Catholic religion. To date I still could see some children bearing those designed young coconut leaves. It gives me time to reminisce. I was once like them. A young girl dutifully lining up to have those leaves blessed by the Holy Water as the priest passed by. we didn't bought the coconut leaves, we always wanted the real palm leaves.. I loved learning about your Palm Sunday tradition. Do you still practice this? i once seen this palm sunday in some TV documentary program.. I'm not a real christian, so easter is just three extra days away from my office.